Greetings all, Glowspore Shaman has just been spoiled. I’ve filled in the empty excel cell that says 4x enabler to three of the decks I’ve spent the last few weeks theory crafting and I’d like to share them with you, but, first, I’d like to showcase exactly why Glowspore Shaman was exactly what we were looking for. #1: GB is very easy to cast because of the Shocklands, Evolving Wilds, and the Dominaria Check Lands that we have grant relative ease for hitting GB in a three color deck, not to mention the ease of two color decks. #2: You can put ANY land on top, not just the ones you flip, which means you can return lands that have been destroyed or lands you’ve previously sacrificed. Evolving Wilds, Field of Ruin, and Memorial of Genius or Memorial of Folly come to mind. Aside from being able to offer yourself a little bit of fixing off of the splash, I think that returning some of the utility lands is an interesting decision point for grindy value decks. 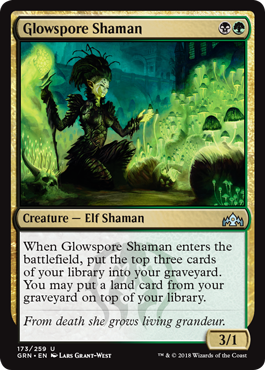 #3: I assume there will be better Karsten math articles about Undergrowth but it seems like any deck that has Glowspore Shaman and Stitcher’s Supplier will have no difficulty fueling Undergrowth will great speed and consistency. This is going to be a critical piece of exploration for the article. #4: Subtype Elf! Having a density of early drops is fairly important to making a Tribal strategy work. If you plan on a light white splash, having this card plus shocklands and District Guide (also an Elf) grants us a lot of mobility. -Powerful early Necrotic Wounds to exile Rekindling Phoenix or cast powerful double spells, decks that want to power out quick Molderhulks or powerful Golgari Raiders. -Recursive decks that are looking to use cards like Graveyard Marshall, Macabre Hatchery, Muldrotha, the Gravetide. -Tribal decks that plan on keying in on multiple elves. -Synergy decks that look to gain value out of cards they plan to sacrifice like the newly spoiled Vraska. This is the deck that I’ve been working on longest. The shell of this deck is based in the 8 milling enablers and a few slower, more expensive enablers higher up the chain. The real power lies in the Secrets of the Mausoleum engine that can essentially tutor out a variety of powerful spells. Being able to search up draw spells, discard spells, various types of kill spells, and the payoffs that send you over the top. Muldrotha is the key of this deck, allowing you to return a variety of powerful types of permanents turn after turn. I’ve toyed around with several different ways to loop Secrets in similar ways to Seasons’ Past decks from the past, but, cards like Salvager of Secrets or The Mirari Conjecture but only time will tell if that’s necessary or if this shell is enough to bury your opponent in cards. More copies of certain cards will certainly be in the sideboard. Thought Erasure is a discard spell that helps enable certain loops and seems quite powerful after board when you want to cut down on something like Necrotic Wound. Sagas like The Eldest Reborn, Mending of Dominaria, or Phyrexian Scriptures could also be powerful in a build like this, but, as you’ll see later in the article, ole’ Thousand Eyes is probably all we need to succeed in BGx. This is another deck that greatly benefits from the consistency of filling the graveyard, but, omitting blue has given us the space to include a grindier, creature-focused base. The key interactions here would be being able to utilize Vraska to gain advantage and Macabre Hatchery to recur your aristocrats over and over again. The key payoffs here is Molderhulk becoming enormous and Izoni granting you an army of tiny attackers. The sheer number of blockers allows Vraska to convincingly ultimate if given enough time, making each threat a powerful tool. This list eschews the value that could be gained by Vraska and instead offers a subtype elf theme where the anthem of Clancaller can be utilized and Marwyn can get very large. Additionally, Beast Whisperer allows us to keep churning through our deck while Glowspore Shaman and District Guide let us keep hitting our land drops. Late game, we can, once again, mount an offensive with Izoni. More cards are spoiled every day and we’re getting closer and closer to having the whole spoiler. I’m excited to see what new decks this fresh Standard format will bring!